UPDATED: Sat., April 13, 2019, 9:54 p.m. The Mariners are off to an historic start to the 2019 season. So far, every game has brought another hero as the M’s home-run binge continues. The record number of games to start the season with a home run climbed to 17 as Mitch Haniger homered against Justin Verlander in the bottom of the fourth inning of the M’s 3-1 loss to Houston on Saturday. As the usual purveyor of gloom and doom in these parts, even I won’t rain on the Mariners’ parade of good vibes in this young season. It’s a great story as a group of misfits and rejects continue to bash the everliving stuffing out of baseballs across the country. Who cares if, come August, we’re talking about Jerry Dipoto trading assets for future potential? The guys who are producing might not be part of the next great Mariners ballclub. This team might not get any closer to the playoffs than any of its 17 predecessors. But they are off to a great start and are a ton of fun to watch in the process, so let’s relish that instead of belaboring the frustration of postseason droughts or worrying about what this team might look like next year, the year after or several down the road. No one seems to be having more fun on the club right now than everyone’s large adult son, Daniel Vogelbach. The barrel-chested lefty is mashing baseballs like they were potatoes. His home run in the 10th inning Thursday to push the M’s to 13-2 was just the latest in a series of winning strokes from the chunky slugger. This is a guy that has nothing left to prove at the minor-league level and really hasn’t for the past couple of seasons. He hit 20 homers in 378 plate appearances for Tacoma last season with a walk rate of 20.4%, his highest mark in a full season in the minors. In limited playing time for the M’s last year, he produced a 12.7% walk rate and showed league-average production prorated for the 102 big-league plate appearances despite hitting just .207. Unfortunately, his defensive liabilities and lack of any real position other than designated hitter have kept him from making an impact on the major-league level until the past few weeks. It’s not like he was going to usurp the DH slot from Nelson Cruz. 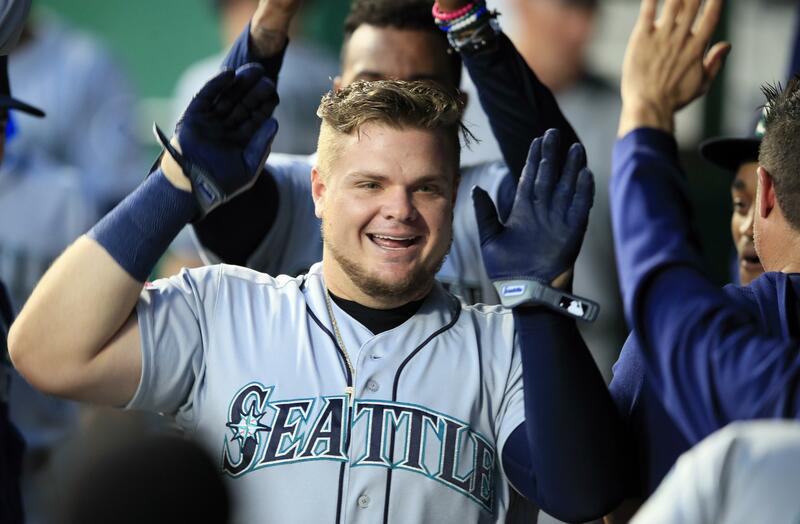 Despite the offseason acquisitions of Edwin Encarnacion, Domingo Santana, Jay Bruce – and holdover Ryon Healy – Vogelbach has made the most of his opportunities when manager Scott Servais has penciled him into the lineup. Vogelbomb, I mean, Vogelbach has six homers in 10 games and 39 plate appearances. And the best news of all might be the fact that his walk rake is still at a robust 17.9%, meaning he hasn’t expanded his strike zone looking for an extra helping of taters. Rather, he seems to have refined his approach as so many have over baseball the past few seasons. Vogey is looking for a certain pitch in a certain quadrant of the plate, confident that he’ll either get the specific pitch he’s looking to drive to the moon, or be happy jogging his stout frame down to first base and wait for the guy behind him to do it. It’s a great success story on a team full of them. As rational baseball fans, we can agree that the M’s aren’t going to continue winning at an .813 clip for the rest of the year. That’s an unsustainable pace of 131 wins over the course of the season. The pitching staff, which has been stellar to this point, is starting to show cracks, with Wade LeBlanc possibly shelved with a strained oblique. The rotation is precariously thin as it is, and any recall from the minors just strains the corps that much more. He also said with the way the team was playing he didn’t have an interest in “changing the rhythm and mojo going on.” What else could he say at this point? Only a curmudgeon would introduce reality into the situation. At some point, though, the homers will taper off and the M’s will come back to the pack. It’s inevitable. This six-game homestand against American League contenders Houston and Cleveland could just be the first reckoning. Whether Dipoto adds or subtracts from the roster as he tries to rebuild the farm system is a concern for another day, during the dog days of summer. That shouldn’t keep us from enjoying and appreciating what the Mariners are doing. They are having fun. Why shouldn’t we? Published: April 13, 2019, 9:38 p.m. Updated: April 13, 2019, 9:54 p.m.